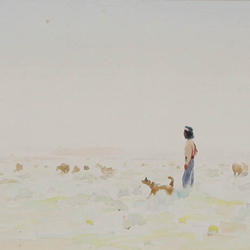 For nearly thirty years Gerard C. Delano studied and painted the rich cultural heritage of the Navajo people and gained a reputation for his use of color, design and strong composition. When asked why he painted the Navajo, he was known to have commented, "The Navajo people are a proud and beautiful race of great dignity. It is my idea to show them as I know them. There are few poorer people anywhere, yet it would be difficult to find a happier lot, and I wonder if there is not a lesson in this for all of us."